In the future, science fiction told us, we'll be able to save astronauts from the risk of spacewalks with a little robot that can scoot around the ship's hull, clinging to the surface with some futuristic sticky feet. Well, that robot has now arrived and its name is Abigaille. The European Space Agency teamed up with Simon Fraser University in Canada to build the latest generation of Abigailles—and they're impressive, to say the least. Inspired by gecko's feet, the robots can walk up walls without the use of traditional adhesives. Instead, the feet are covered in dozens of "footpad terminators"—see a microscopic view to the left—that cling to the surface with the help of atomic interactions. This technique of borrowing from nature is known as "biomimicry." 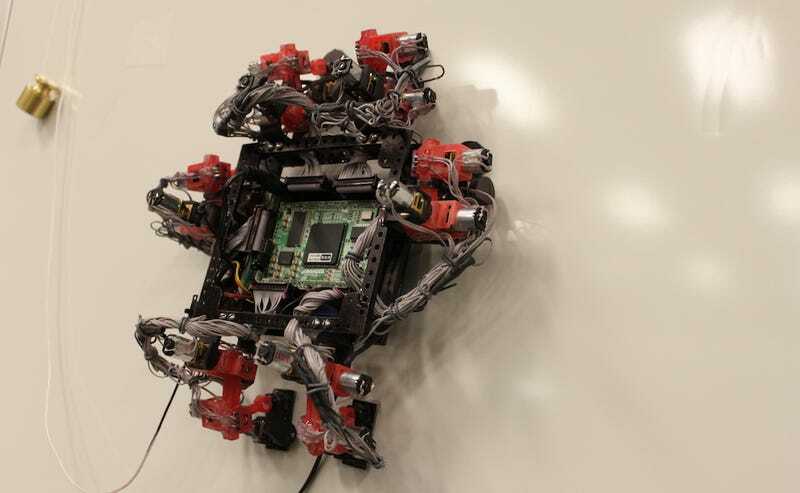 "Our Abigaille climbing robot is therefore quite dexterous, with six legs each having four degrees of freedom, so it should be handle environments that a wheeled robot could not," the ESA's Laurent Pambaguian explained in a press release. "For example, it can transition from the vertical to horizontal, which might be useful for going around a satellite or overcoming obstacles on the way."